I actually read the previous (2002) edition of this book, first published in 1975 because I’ve been meaning to read it for a long time and only did so because my Reading Liberally book club chose it for this month. The book makes the case for better treatment of animals: elimination of research on animals and the end of industrial farming of animals for human consumption. But it goes beyond that and also makes the case for vegetarianism and veganism. While I don’t know if I’ll be able to put vegetarianism into practice, it’s a compelling case, one that I first accepted when I read a much shorter book, Moral Literacy: Or How to Do the Right Thing by Colin McGinn. Both books rely on the notion of suffering to conclude that it is wrong to kill or otherwise abuse animals as we do. McGinn’s book is purely logical, while Singer piles on the gross details of industrial farming and testing laboratories. The principle for both of them is equal consideration of equivalent interests–basically that human rights do not trump animal rights. I have to say that they both make compelling arguments. I read this book almost twenty years ago. I had already become interested in animal rights and Singer’s book was like the attorney’s summation at the end of a trial. 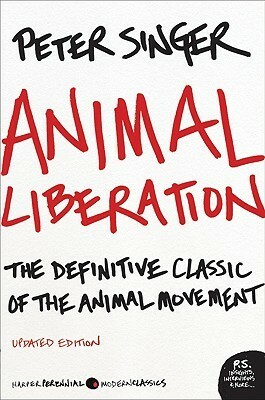 Singer builds such a compelling case for the animal rights position that the reader is left with the choice of either making what some might consider a radical change or acknowledging one’s own complicity in the structural pain and suffering imposed on non-human animals. I chose to make the change and have never regretted it. I’ve been a vegetarian for almost twenty years. It’s actually a pretty easy change if you don’t mind being limited at certain restaurants. It’s a choice I’ve never regretted making. Chuck, I think you state the choice exactly right. I’m moving in the direction of vegetarianism; haven’t made it just yet, but I think I’ll get there.